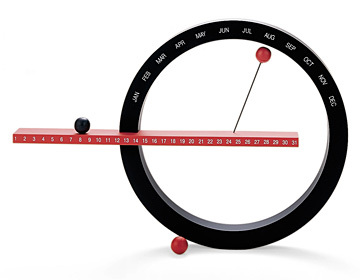 Perpetual Calendar - Red / Black. Designed for the Museum of Modern Art, NY, this unique calendar can be used year after year thus making it an eco-conscious product. The calendar can be placed on a desktop or mounted on a wall. Its string-tethered Maglev (magnetic levitation) ball is suspended in mid-air and is manually moved to mark each month. A second ball on the horizontal beam indicates the day. Constructed of injected-molded ABS recyclable polymer and magnets. The new small version, designed in 2008, commemorates the 10th anniversary of the original design.